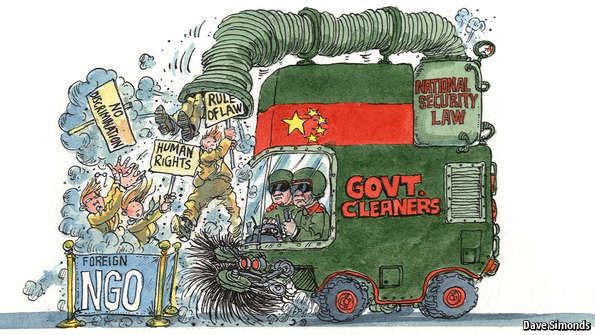 A new draft law spooks foreign not-for-profit groups working in China. BEIJING: Recently the Communist Party has put forward a raft of proposals aimed at preventing perceived challenges to its monopoly of power. On July 1st a national-security law was passed that authorised “all measures necessary” to protect the country from hostile elements. Now a draft of China’s first law for regulating foreign non-governmental organisations (NGOs) is expected to pass in the coming weeks. The law is deemed necessary because of the threats NGOs are presumed to pose. The draft law represents a mixture of limited progress and major party retrenchment in a sensitive area. Under Mao Zedong, China had no space for NGOs. But they have multiplied in the past decade to fill the gaps left by the party’s retreat from people’s daily lives. Officials say the law will help NGOs by giving them legal status, a valid claim. But it will also force strict constraints on foreign or foreign-supported groups. No funding from abroad will be allowed. And all NGOs will have to find an official sponsoring organisation. They will then have to register with China’s feared public security apparatus, which will now oversee the entire foreign-backed sector. Many workers at foreign NGOs worry that the party wants to change the definition of what an NGO is so that it can kick out any organisation it does not like. If the law is implemented as drafted, one foreign employee in Beijing says, it will have “a broad and chilling effect”. Yet opposition from foreign groups, diplomats and businessmen has already brought hints that the party might soften its stance. About 1,000 foreign NGOs operate in China, with thousands more providing financial and other support. Some larger ones, such as Save the Children, have been there for decades and are welcomed. Groups overtly supporting labour or human rights are not. Foreign money has been crucial, though it is impossible to measure exactly how much flows in. For anything sensitive, such as promoting the rule of law or policies against discrimination, the only source of funding is abroad. This is the money the party wants to shut off. “Party leaders are shooting themselves in the foot,” says Shawn Shieh of the China Labour Bulletin in Hong Kong. He believes the police do not have the resources or knowledge to deal with the thousands of foreign groups that would need to register. Perhaps the party does not care. Disrupting some anti-poverty work is “the necessary cost of maintaining control over the groups it deems subversive,” says Jia Xijin of Tsinghua University’s NGO Research Centre. The law, as written, could also have an impact abroad. Any foreign non-profit organisation, broadly defined, that does not have an office in China would need a temporary permit and an official sponsor to engage in any kind of programme there. Anything from a university exchange to a visiting orchestra could be denied entry based on something said or done that is perceived to be against China. The aim may be to silence criticism of the regime abroad. More than 40 American trade associations and lobby groups in China, including the American Chamber of Commerce, have also complained that the law could be used against them. The party may try to allay such fears because it cares about foreign business. But it seems unafraid to show that it wants non-governmental organisations to bow to the government. “They are saying: ‘We don’t want any of your values, we’ll do things our way,’” says a former diplomat in Beijing. Many Chinese officials believe foreign-funded NGOs to be Trojan horses for Western ideas. The Arab spring, the revolution in Ukraine and demonstrations in Hong Kong last year confirmed those suspicions in their minds. President Xi Jinping has cracked down on promoters of Western liberalism. Last October police detained the former head of a reformist think-tank in Beijing. In June two members of a group promoting the rule of law were arrested. Many such groups have received funding from the Open Society Foundations in New York, founded by George Soros, a billionaire philanthropist. Several hundred civil-rights lawyers have recently been detained. Yet the draconian nature of the draft law has surprised many, because legislation covering domestic NGOs seemed to be softening. A new charities law is due to be passed soon to spur individual and corporate philanthropy. Annual contributions to charity have risen tenfold in five years, to $15.2 billion. And last year China actually liberalised the environment for local groups it deemed to be non-political. The party knew that its ability to deliver grass-roots services was failing and discovered that many NGOs filling the gap were not anti-party, as it had feared. So it began to encourage and fund them, just as nascent Chinese foundations and philanthropists did the same. Groups doing social work can now register without a sponsor. Some can also find financial support within China, says Ma Jun, the founder of an environmental NGO. As for foreign groups, the restricted number of bodies authorised to be a sponsoring agency, and the limited incentive to play that role, mean that even apolitical groups will struggle to find a sponsor. Yet if they are not seen as dangerous they might be allowed to continue working in the grey zone. In late July the minister for public security, Guo Shengkun, claimed that China supported the activities of foreign NGOs if they are “carrying out friendly exchanges and co-operation”. The new draft law follows a meeting of the Communist Party last year that trumpeted how China must be ruled by fazhi, a phrase translated as the “rule of law”. But Ms Jia points out that fazhi is not the rule of law as understood in the West. It should, rather, be translated “law-based governance”, meaning that the law is a tool the party can use to maintain order. The new law will not necessarily be implemented to the letter. As with the internet, the party is eager to see the NGO sector flourish, but only on its own terms. It will use the language of civil society to persuade the world that such a concept exists in China. Yet anyone pushing genuine civil liberties will not be tolerated. Gradual reform is possible, but control remains everything.